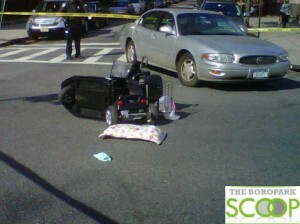 A person in a wheelchair was struck by a vehicle on 9th Avenue & 49th Street, Tuesday morning, BoroParkScoop.com reports. Boro Park Hatzolah was rushed to the scene, and transported the victim one block away to Maimonides Hospital. The victim is listed in serious condition. The NYPD Accident Investigation (AI) Team has been requested to the scene for an investigation. Just a short while earlier, a school bus carrying “special needs children” was involved in an accident at 10th Avenue and 45th Street. 11 Children were transported to local hospitals by Boro Park Hatzolah and NYC EMS. Next articleIs An Israeli Military Assault On Iran In The Works?